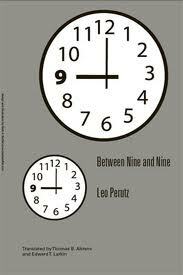 Between 1989 and 1996 Harvill published eight of Leo Perutz’s ten novels in English translations: he was being rediscovered, as Stefan Zweig, another Viennese writer (Perutz was born in Prague but lived in Vienna until 1938 and the Nazi Anschluss) has been more recently. His first novel, The Third Bullet, has (as far as I can ascertain) never been translated into English, but his second, From Nine to Nine, certainly had – in the 1920s. Having collected all of the newer translations of Perutz’s novels over the last ten years, it was galling to know that another was out there, especially with its intriguing 24 type premise, being set over twelve hours in the life of its protagonist (as it turns out, this isn’t entirely the case). Imagine my delight, then, when I discovered last year that a small American publisher, Ariadne Press, had brought out a new translation (by Thomas Ahrens and Edward Larkin), with the slightly altered title Between Nine and Nine. His ‘strange behaviour’ includes entering the store warily, looking around, ordering numerous items of food one after the other but not picking them up, and leaving suddenly when the owner is out, but not without first having placed the money owed on the counter. The reason for his strange behaviour, which continues throughout a number of scenes, is not revealed until almost halfway through the novel. Needless to say I will be revealing it soon. If you would rather not know, don’t read on – I certainly had great fun not knowing (which is Perutz’s intention, mirrored in the fact that the narrative is never from Demba’s point of view, but always from that of those he encounters: seven of the first eight chapters begin with reference to a secondary character prior to Demba’s appearance). ‘In that case, kindly remove your hat, Stanie. At our office, people take off their hats,’ said Etelka Springer. To prevent Demba simply remaining in hiding until Steffi can get him a key (at nine o’clock that night), Perutz gives him an urgent quest. Having discovered that his girlfriend, Sonja, is going on a trip with another man to Venice, he feels that if he can raise the necessary money to take her she will go with him. The second half of the novel is filled with near misses as he comes frustratingly close to the cash without being able to lay his hands on it. (It was an attempt to sell a stolen library book that first brought him to the police’s attention). Demba is therefore an intensely sympathetic character: a betrayed lover, on the run, with two taxing problems to solve in twelve hours. Throughout his adventure Perutz also pokes fun at Viennese society; Demba’s position as an impoverished tutor makes him something of an outsider. The novel ends with a further twist I won’t reveal. This may not be Perutz’s greatest novel, but it is both tense and genuinely amusing. It’s time he was rediscovered again. Having waited four years since Murakami’s last novel, 1Q84’s near one thousand page length seems somehow too much at once: it’s a little like dieting for a year and then attempting to devour the contents of a baker’s window in one afternoon. I’ve therefore decided to take its division into three books at face value and read them separately, one a month, over the next three months. This will still allow me to be completed comfortably before his original Japanese audience: although Books One and Two were published simultaneously in Japan (in May 2009), there was then almost a year’s wait for Book Three. Its length, and the two and half year anticipation between publication in Japan and in English, were not the only reasons that made 1Q84 probably the most eagerly expected (translated) novel of 2011. There was also a sense that Murakami’s powers as a writer were on the wane, and that this ambitious undertaking would provide proof one way or the other. Later investigation will show that this change resulted from a shoot-out between police and a radical sect at Lake Motosu which Aomame has no memory of. However, before this we will have seen Aomame kill a man she has never met before: her ‘work’, we discover, involves tracking down and murdering men who have been abusive to their wives, at the behest of a wealthy dowager. As Aomame’s back story unfolds we find that she has a personal motivation, her best friend having committed suicide after years of mistreatment at the hands of her husband. Murakami’s two great strengths come into focus here: his ability to create fictional worlds, and then to inject fantastic elements into them without losing credibility. 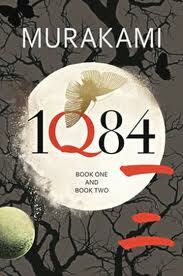 1Q84 might be seen as representative of this: there is little difference between it and 1984, but it is different. 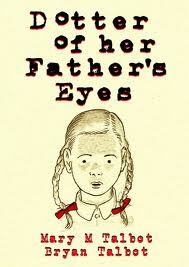 Similarly, Murakami takes reality and twists it slightly; it feels real but we are always aware of its difference. Murakami has used this rather sentimental image before to suggest some kind of spiritual bond, and here he contrasts it with a series of casual sexual relationships – Tengo’s with a married woman, Aomame’s with men she picks up in bars. However, a little like Dickens (though Murakami is not such a stylist), despite the implausibility and the sentimentality, the power of the narrative is difficult to resist. Evelio Rosero won the Independent Foreign Fiction Prize in 2009 with his novel of civil war descending on a small Columbian village, The Armies. Now he returns with a second novel translated into English, Good Offices, where we are introduced to another isolated and inward-looking community, though with the more pacific setting of a church. This is a slighter novel, weighing in at only 141 pages, and the story it tells takes place over one night, with little in the way of action. What it does share with its predecessor is the haunting sense of a perfectly realised other world with its own unsettling logic. To some extent this is true of all the characters, with Rosero deliberately obscuring their motives. 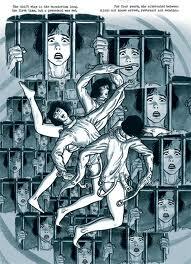 Slowly Almida’s corruption is revealed, and his return becomes the focus of the novel’s tension. Rosero, of course, also has a wider target: the church itself, its leaders and its role in the community. 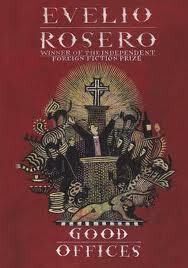 While such satire might have a greater resonance in Catholic South America, this remains a haunting novel with a satisfying denouement: we might even consider that Tancredo will be able to reconcile the animal and intellectual sides of his character. You are currently browsing the 1streading's Blog blog archives for February, 2012.